For other places with the same name, see York (disambiguation). York is an ancient cathedral city with a history that dates back to before Roman times. A county in its own right for hundreds of years, York is now in North Yorkshire, England with some of the best preserved historical buildings and structures in Europe. As of the 2001 census, the population of York was 181,000. York is frequently ranked with Manchester as the second most visited city in England after London and is, of course, famous for giving its name to the city and state of New York in the United States. York was known as Eboracum by the Romans, who founded the fortress city on the River Ouse in the year 71. York was home first to the Ninth Legion and later the Sixth. York quickly became one of the most important cities in Roman Britain, and after 211 became the capital of the province Britannia Inferior. Constantine the Great—later responsible for making Christianity the official religion of the Roman Empire—was first proclaimed Emperor in the city. After the Romans York was taken by the Angles and was renamed Eoforwic c. 400AD. Captured by the Vikings 866, the city quickly took on a new identity as Jorvik (pronounced "Yor-vik") and experienced a major urban revival as a centre of Viking trade and settlement in northern England. The Coppergate excavations of the 1970s revealed much of this Viking past. Most of the streets were given names ending in -gate, which are retained today, just as you will find in towns in Denmark and Sweden. 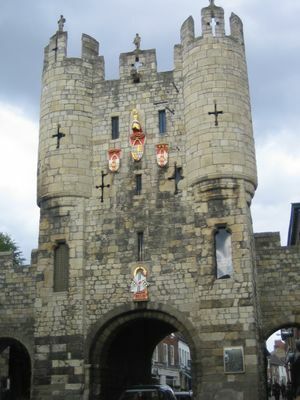 After the Norman Conquest, York became the second city of England, and kings often moved their court here while campaigning against Scotland. King Richard III had a special connection with the city and although portrayed as a villain by Shakespeare, many locals will tell you that it's all Tudor Propaganda. During the Georgian era, York's racecourse attracted the rich and influential from around the country, which meant in turn that the city was saved from the worst ravages of the industrial revolution - the factory and mill owners didn't want to pollute their "playground". Industry finally came to York with the arrival of the railways in the 1830s, and owing to its strategic position approximately halfway between London and Edinburgh on the East Coast Main Line, the city became a major headquarters, junction and works for the railways, a role which it continues to this day. The other major industry of the city was confectionery; the Rowntree's works, now owned by Nestlé, is the only one still producing but a delicious chocolatey smell still wafts through the city when the wind is in the right direction. Although York is not directly on any of the main north-south motorways, the connections are reasonably good. 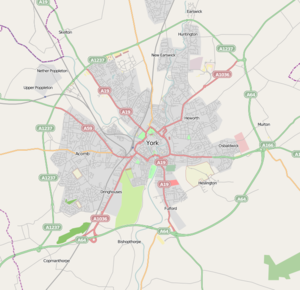 From the south, the quickest route is probably to take the M1 northbound to junction 32, the M18 eastbound to junction 2, the A1(M) northbound to junction 44 and then the A64 eastbound to the York Outer Ring Road (A1237). Alternatively, you can take the M1 all the way to the A64, but the upper reaches of the M1 around Sheffield and Leeds can get very congested, especially at rush hour. From the west, the A59 and the M62 provide connections from Liverpool and Manchester. From the north, the A1 and the A19 link York with Tyneside, Northumberland and southeastern Scotland. Driving into the city centre itself is something to avoid. Traffic congestion on the main arterial roads serving the city (especially the A19 on Bootham and the Inner Ring Road) can get very bad, especially during the rush hours and on Saturday mornings. The remodeling of some roads near bottleneck junctions to accommodate bicycle lanes has made traffic jams even worse still in recent years, and parking in the city centre is very expensive. If you are just visiting York for the day, using a Park and Ride costs a lot less than trying to park in or near the city centre, and there are six sites dotted around the Outer Ring Road. However, the last buses from the city centre leave at around 20:00 in the evenings, and you are not allowed to leave your car in a Park and Ride overnight. Therefore, if you are staying overnight in York and arriving by car, make sure that your hotel offers parking before you book your room. If you are visiting only for the day but will be staying until late evening, you will need to use a city centre car park. Wikitravel has a guide to rail travel in the United Kingdom. York is one of the main hubs of the UK rail network, with a large range of services and destinations to choose from. The station itself is an attraction and was voted the 'nicest' station in the UK in 2007. Because of the number of lines that pass through the city, services tend to be frequent. Indeed, it was the largest train station in the world when it was first built. While intercity trains can be expensive, regional services are relatively affordable. Buying tickets online a few weeks in advance can provide substantial savings on long distance tickets. National Rail  operates several services from York. York is situated halfway between Edinburgh and London on the East Coast Main Line. East Coast Trains run services along this route approximately every half hour between King's Cross station in London and Edinburgh Waverley. The journey time from London is typically about 2 hours and 15 minutes, while Edinburgh is 2 hours and 30 minutes away. Grand Central Rail  operates 4 trains per day in each direction between York and London. Arriva Cross Country  operates trains between York and Scotland, and across the country to Birmingham, Oxford, Reading, Bristol and the South-West. First Transpennine Express  operates service to and from Liverpool, Manchester, Manchester Airport, Leeds, and Huddersfield. The service runs 24 h, making it possible to have a late night out elsewhere in North England while still being able to get back to York. It runs every 30 minutes during the daytime and early evening but has a fewer trains in the evenings and even after midnight. Other regional trains run to Sheffield, Doncaster, Hull, Harrogate and Scarborough, Durham and Newcastle. Train times can be found on the National Rail Planner  or by calling 0845 748 49 50 from anywhere in the UK. National Express  operates coach service to/from York. Tickets can be purchased online, at the station, or from the Tourist Information Centre at 1 Museum Street in the city centre. The coach stops near the railway station. They is a bus every 20 minutes from Leeds and Malton and every 1-2 hours from Whitby and Scarborough run by Transdev Yorkshire Coasltiner and frequent buses from Hull, Market Weighton, Pocklington, Driffield and Bridlington run by East Yorkshire. They is also buses to Harrogate at every 2 hours and frequent buses to Easingwold, Thirsk and Helmsley. For all of York's bus routes Click Here. Enter the UK at one of the London airports and travel onwards to York overland, either by road or by rail. If your itinerary includes other parts of the UK besides the northeast, this may be the best option, as the five London airports have a wider range of flight options and usually lower prices than are available for direct routings into an airport closer to York. Enter the UK at Manchester Airport and travel onwards to York overland either by road or by rail. Manchester Airport has a train station within easy walking distance of all terminals that has regular direct trains to York with a journey time of less than 2 hours. If Yorkshire and/or the northeast is the main destination of your visit to the UK, fly directly into the northeast using an airport with good road connections to York if you will be renting a car and/or are being picked up from the airport. If Yorkshire and/or the northeast is the main destination of your visit to the UK, fly directly into the north-east using an airport with good public transport connections to York if you will not have access to a car. If you are arriving in the UK at one of the London airports (Heathrow (IATA: LHR), Gatwick (IATA: LGW), London City (IATA: LCY), Luton (IATA: LTN) or Stansted (IATA: STN)), your best bet is to travel to York either by road in a rental car or by train. It will normally take you 4-5 h from the time you reach the arrivals hall at any London airport to get to York city centre by train, including the time it takes to get from the airport to King's Cross station. Leeds-Bradford International Airport (IATA: LBA) is the geographically closest airport to York, located 31 mi from the city by road, but it is also arguably the least convenient and most expensive for visitors to the city. The low-cost carriers (LCCs) Jet2  and Ryanair  operate extensive services throughout Europe. KLM is currently the only legacy airline offering hub-and-spoke connections worldwide via its three daily flights to and from Amsterdam. In light traffic, it takes about 1 h by road to York using the A658 and the A59, but often the journey takes 2 h. This route can get very congested around the outskirts of Harrogate during the rush hours, and there are several villages with 30mph speed limits along the way. York residents collecting arriving passengers should note that it costs £12/h if you need to park and go into the terminal building (for example, if the flight is delayed): you are allowed to wait at the pick-up and drop-off area for only 10min. There is no direct public transport to York. The best way is to take the 757 bus outside the airport to Leeds City Bus Station, the last stop, and then any bus at stand 25 to York. Manchester Airport (IATA: MAN), 84 mi by road from York, is the UK's largest airport outside London and offers a wider choice of LCC and legacy airline services worldwide. These include direct flights from the USA operated by American, Continental and Delta. By road, the journey using the M62 and the A64 takes about an hour and a half in average traffic, but if you get caught in the rush hours around Leeds and Bradford it can take a lot longer. The train station in the airport provides direct connections to York throughout the day and night (see by train above), with a typical journey time of 2 h. It is worth booking tickets for rail connections online in advance, because tickets bought on the day are often a lot more expensive, and, if you are travelling at peak times without a reserved seat, you may have to stand for most, if not all, of the journey (these trains also serve commuters to Manchester and Leeds, getting very crowded). Doncaster-Sheffield (IATA: DSA), 41 mi by road from York - mainly serving European holiday destinations. This airport is not easily accessible by public transport. You have to take a bus to the Doncaster station. Humberside (IATA: HUY, 48 mi) - KLM from Amsterdam and thence worldwide. Using the A1079 and the A15, the journey time to and from York is around an hour in typical traffic. This route takes you across the Humber Bridge, which is a spectacular sight in itself, but it can get congested in the rush hours. This airport is not easily accessible by public transport. You can take a bus to Hull or Grimsby stations. If KLM is offering a particularly attractive deal to Humberside, you will have access to a car and you are staying in a southern part of York, Humberside is worth considering. Durham-Tees Valley IATA: MME, 47 mi from York - LCCs to UK and European destinations, plus KLM to Amsterdam and thence worldwide. The airport was formally called Teesside International until it was renamed in 2004, and the name "Teesside", "Tees-side" or "Teesside Airport" still appears on many local road signs and on tickets and boarding passes issued outside the UK. Although air fares to Durham-Tees Valley can cost a lot, it is well worth considering as a starting point for visiting northeastern England; as an underused regional airport, waiting and queuing times are very short. However, to recoup the lost revenue from falling passenger numbers in recent years, the airport introduced a facility fee of £6 per departing passenger (which must be paid before you are allowed through the security check). If you take the A67 eastbound from the airport through Yarm and Kirklevington and join the A19 southbound to York, this route is hardly ever congested, even during weekday rush hours. Using public transport, you can take a bus to Darlington. 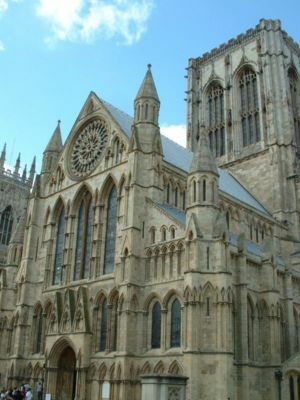 From there, York is a 30 min train ride on the East Coast Main Line, with frequent services throughout the day. Newcastle (IATA: NCL, 79 mi), offers a wider range of legacy services than LBA, HUY or MME, with British Airways and Emirates providing long-haul connections as well as KLM. Air Transat also operate direct flights from Toronto during the summer months. The journey to York by road using the A1 and the A59 takes just under two hours. Using public transport, a Newcastle Metro  train takes about 45 mi from NCL to Central Station, from which York is a 70 mi ride on the East Coast Main Line. The major car rental chains are available at all of these airports except Doncaster-Sheffield. The roads within the old city (i.e. 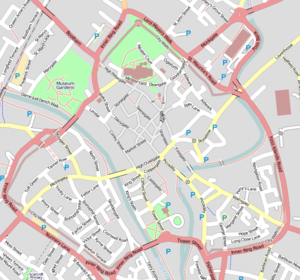 within the city walls and to the north of the river ouse) are pedestrian precincts, closed to all cars except disabled drivers and emergency vehicles between 8:00 and 16:00, and most of the sights are only a short walk between one another. Take care walking around the city centre when the roads open to car traffic at 16:00, as the roads fill up quickly with delivery vehicles servicing local shops and businesses. The city centre is small enough to walk from one side to the other in 20 minutes. The best advice for driving in York is don't. The roads were designed for carts pulled by oxen, and the city council is actively discouraging car use through a combination of high parking charges and traffic-calming measures. If you are bringing a car to York, your best bet is to leave it in a Park and Ride, at your hotel, or if absolutely necessary, a city centre car park. The "Park and Ride" car parks are signposted as you approach the city on the A64(S), A59, A19(N) A64(N) A1079 and A19(S), and provide free parking. Each has a colour coded "bus-line" with a fixed price shuttle bus service that operates every 8-12 minutes from 07:00 to 19:00 weekdays and Saturdays. Children travel free (2 per fare paying adult). The Park and ride is very popular during the week with commuters who work in York, but live outside the city. York is one of the most cycle-friendly cities in the UK - there's an extensive network of cycle routes in and around the city, and most of the traffic controls have been set up to give cyclists priority. There are no significant hills in or around the city centre, which is a big help. The river path along the Ouse contains some wonderful bike routes out of the city. Also beware that police and CCTV operators take a very dim view of cycling without lights after dusk, or cycling in the city centre pedestrianised area before 16:00, and will happily hand out an on-the-spot £30 fine for doing so. You should be able to pick up a copy of the York Cycle Route Map for free from cycle shops, or alternatively you can find PDFs here: . Bikes are available to rent from a number of locations around the city, including the railway station. York Races. Held 6 to 8 times in the year with the key meetings in May and August. Mystery Plays. Medieval Passion plays, revived after the Second World War and the forum which first brought Dame Judi Dench to critical attention. Don't run every year and vary between the traditional plays acted on floats carried around the city and more formal renditions which change venues - the 2012 edition was the first since 2000, and was held in the Museum Gardens. York Festival of Food and Drink. Late September every year. The food element majors on Yorkshire food, while the drinks program has a world wide and wine orientated theme. The range of events is very wide with demonstrations, tastings, markets and dinners everyday for 10 days. Big 'Slow Food'/Fairtrade and other 'worthy' food element allied with lots of hands on cooking for kids. Viking Festival,  February. A big event with a lots of appeal for children - lots of dressing up and mock fighting but backed with the serious educational purpose of the Viking Centre. York Early Music Festival. Early July. World class event with very serious intent . York Beer & Cider Festival  The Knavesmire (Tadcaster Road end) is the new venue for an expanded York Beer & Cider Festival held in September. The increased capacity means they will be able to offer up to 200 beers, 30 ciders and perries and a foreign beer bar, with wine and soft drinks also available. This is an exciting expansion for the branch which they hope will be enjoyed by people from York and beyond. There’ll be live music on the Friday and Saturday evenings as well as a good range of food from mainly local caterers and other stalls. There’ll be a large amount of seating – inside the tent if it’s wet, with some outside if the weather’s good. Children are welcome during the afternoon sessions. The festival site is less than 15 minutes from York Station and is served by regular buses (12 Woodthorpe, 4 FTR Acomb, 13/13A Copmanthorpe and the Coastliner). York Festival of Traditional Dance September 2015 York’s own Ebor Morris, in conjunction with City of York Council and other local teams, invite a rich variety of traditional dance sides from all over the country to join in a non-competitive celebration of the diversity of ritual dancing. The Festival occupies the first weekend of September. The Saturday begins with a colourful dance procession from the Guildhall to Parliament Square, before the teams separate to dance on site, in King’s Square and St Sampson’s Square throughout the day before a final grand show in front of dignitaries. The Sunday dancing is less formal, taking place in St Sampson’s and King’s Square on the Sunday morning. Over the years we have had representatives of all the leading traditional team styles: the stick and hanky Morris of the Cotswolds, the large clog-stepping sides of the North West, the intricate weaving Yorkshire Longsword, the country-dance like East Anglian Molly, the bizarre costumes and disguises of Welsh border Morris and the swift interlacing of Northumbrian Rapper sword. This year’s Festival details are to be confirmed. We'll be inviting teams from all round England to join in this celebration of English Traditional dance, hosted by local team Ebor Morris. The two other local sides Acorn Morris & Minster strays should be in attendance, together hopefully with old favourites such as Brackley Morris from Northamptonshire. Vue Cinemas -  - The city's largest multiplex, located on Clifton Moor Retail Park on the north-west outskirts of York. Access by car, or take the no.6 bus to Tesco or the no.20 bus from Acomb or University. York comes highly recommended for its unique shops & boutiques. There's the usual range of high-street stores, but York is also a great place if you're looking for tourist tat of the highest order. Tat-central is The Shambles - the narrowest (and most crowded) street in York, with a full range of a present from York - emblazoned merchandise manufactured in the Far East. Shops in York change from year to year but the beautiful old fashioned wooden shop fronts and buildings have not changed much since they were first built. Walmgate and Fossgate contain some interesting shops, including several small independent book shops and retro clothes shops. York Designer Outlet, an indoor shopping centre on the southern outskirts of York containing 120 clothes stores from many top-name brands such as Hugo Boss, Fred Perry and Ted Baker. Located on the A64 dual carriageway and frequently served by bus services from the city centre. For budget eating, try any traditional pub (though food quality may be variable). A cafeteria in an old church facing away from Whip-Ma-Whop-Ma-Gate sells cheap good food - eat on the grass outside. Once Across the Garden  , Completely vegan restaurant at 10 Church Street, YO1 8BG. Friendly staff, child and dog friendly. Selling burgers, vegan fried 'chicken', hot dogs, tofu dishes, curry pots, sweet treats and more. Also have a Shambles market stall on Saturdays from 9:00 to 16:30. Walmgate Ale House (formerly Melton's Too) - 5 minutes walk from the center in an area called Walmgate - good food in pleasant olde worlde environment. Miller's - Delicious fish and chip shop in Fulford, which also works as a restaurant. Reasonable prices and as good a plate's worth as you'll get in York. The Spurriergate Centreon Spurriergate - a great little cafe in an old church, well worth a visit just for the architecture but the food is good and there are vegetarian options - the staff have a "godly" feel but are friendly enough. The Lime House, Goodramgate, . This restaurant has won many awards but still doesn't seem to be on the tourist radar. This is a shame, because it serves some of the most inventive, lovingly-prepared food in the city. Starters from £5, mains from £13. For upmarket eating, try York's 'restaurant district' on Fossgate and Walmgate. Micklegate area: which includes Rougier Street: Young, loud, brash, boozy, hen & stag nights abound. Wall to wall pubs in a very small area serving a younger clientele intent on getting well oiled and having a good time until 3 - 4AM. Coney Street area: Goes from St Helens Square along Coney Street turning right to the edge of Ouse Bridge. Pubs & Bars are a lot more upmarket and it takes in 3 bars on Coney St overlooking the River Ouse. Goodramgate, Swinegate area: Probably the best area for those who like a mix of traditional pubs, nice continental bars and 2 good swanky modern bars for dressing to impress. The atmosphere is the most laid back in this area and has the widest age range appeal. The Quarter which includes Little Stonegate & Grape Lane, houses several nice bars such as Pivo, Stonegate Yard, Bobo Lobo, Slug and Lettuce (chain bar), 1331, Wilde's & Oscar's to name but a few. Tends to be slightly more chilled out but more expensive than other areas. Still rowdy on a weekend but more relaxed during the week where salsa lessons take place in a couple of the bars. The area is sometimes referred to as the 'latin quarter' due to the nature of some of the bars and restaurants. The Winning Post in York, Bishopthorpe Road. Voted the pint best Lager York 2009 (keeps Head and Effervescent longer then other pubs in the City). Free event venue for new bands edit. Hotel rates in York tend to be more expensive compared to cities of similar size. Ace Hostel, . 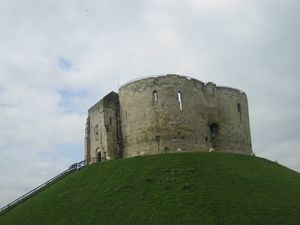 4 Star Hostel from 16£, all bedrooms en-suite and with various views of the walls of York, Micklegate or York Minster. In the city centre, 2 minute walk from York Minister. Situated in a grand Georgian 1752 townhouse. Features stone-flagged entrance hall, sweeping staircase, vaulted cellar, and well equipped with TV lounge, Game Room, Sauna, 24-Hour Bar, coffee and tea making facilities, and other services. Free continental breakfast is included in the price, including hot & cold drinks/cereal, croissants, toast, fresh fruit and jams. Barrington House, . 4 Star Hotel from 30£. 10 minutes’ walk from the city centre, halfway between the railway station and York Racecourse. Situated in a quiet cul-de-sac, just off the main road, this Edwardian townhouse was built around 1906. Today, the house still retains many original features from that period. All of the en suite rooms are well equipped, with TVs and tea/coffee making facilities with complimentary biscuits. Breakfast is included in the price and guests can choose a full cooked English breakfast or a continental-style breakfast featuring various cereals, yoghurt, grapefruit, fruit juice and fresh fruit. The Quality Hotel York, . from 57£. Inexpensive compared to other hotels that are further away. Eye catching, modern design 6 story hotel, matched by stylish contemporary interiors. Very close to the city walls if you plan on walking around the city walls - a good way to see York. Also close to the shops, and if you've got heavy shopping bags, it will make a lot of difference to be close to the city center. York YHA Hostel, (from 19£ ) twenty minutes' walk away from the city walls, is clean and cheap with good showers. Good family rooms for 4. Adequate breakfast is included in the price (they'll pack you a breakfast if you're leaving especially early). Travelodge York Central,  . located next to a popular Wetherspoons bar/restaurant next to the city wall and River on Piccadilly. 5-minute walk up Piccadilly to Parliament Sq in the Centre. Rooms are comfortable and private, and are pretty cheap (~£29-£60) if booked in advance online. Because of its prime location, walk-in fares are likely to exceed £80pn. Don't take the breakfast - instead go next door to the Weatherspoons, it's much better value! If you have a car, also try the Travelodge York-Tadcaster about 5miles from the city centre on the A64. Rooms will be significantly cheaper. Ibis York, . Ibis York Centre hotel is a budget hotel, located at the gates of the city walls, within a short walking distance from the Train Station and the main city centre. Knavesmire Manor - +44 1904 702941 . Very good value hotel with indoor swimming pool with free parking, just ten minutes' walk of city centre. This hotel is the prefect venue for the York famous racecourse. All rooms are en suite with breakfast and evening meals available too. Bar available at the hotel too. The Dean Court Hotel - they don't come much more central than this - it's right outside the front door of the Minster, and the city center is just streets away. An imposing Victorian pile, this Best Western hotel has recently been renovated downstairs, and now sports a contemporary 'wine bar' look that's in complete contrast to the red-brick exterior. Unfortunately the refit didn't make it past the ground floor, and the bedrooms are beginning to look somewhat tired. Food is over-the-top nouvelle cuisine style, and they've got prices to match the location. Great if you're looking for something at the heart of the city, but not particularly good value given the standard of accommodation at the moment. Hotel Noir - +44 1904 643711 . Very good value hotel within ten minutes' walk of city centre. There are 28 comfortable rooms, all en suite. Free, small car park, good breakfast and free mini-bar. Good for a short break. The road outside can be noisy, so stay in one of the rear rooms if you're a light sleeper. Lively bar as well. The Monk Bar Hotel - just outside Monk Bar, on the inner ring road. Perfectly adequate unspectacular Best Western-style hotel, but beware the bedrooms at the front - they overlook the inner ring road which is exceedingly noisy during the morning and evening rush hours. Not particularly good value for money, as the accommodation is unspectacular and food could best be described as adequate. Premier Travel Inn, tel 0870 990 6594, . Five minutes walk from the train station. A recent conversion of older low rise buildings. Clean, with a king size double bed and excellent showers. Rooms cost £70 a night plus between £3 and £7.50 for each adult for breakfast. Good value for families as 2 kids can sleep in the same room on pull out beds, and they get breakfast for free with a paying adult. Queen Anne's Guest House, . Approximately 7 mins walk from Bootham Bar (near the Minster), this is a small friendly guest house with a simple Full English Breakfast awaiting you in the morning, after a refreshing sleep in one of the clean, quiet rooms with en suite. Good value for money, the key to the front door is issued on arrival ensuring you do not have to tote bags around all day. Ramada Fairfield Manor Hotel, . The Ramada Fairfield Manor Hotel in York is set in a recently renovated Georgian mansion in six acres of grounds.This elegant York hotel mananges to combine the calm of an 18th-century country retreat with the vibrant cultural attractions of 2000-year-old York three miles away. Novotel York Hotel, Fishergate , tel +44 113 396 9004, http://www.accorhotels.com/gb/booking/room-dates.shtml, Novotel York Hotel is located on the banks of the River Foss. Marmadukes Hotel, tel 0870 243 0765. St Peters Grove, . The Judge's Lodging, , 01904 638733, [email protected] Housed in a grade 1 listed Georgian townhouse, The Judge's Lodging has been extensively renovated and now offers travellers a luxurious and historical place to relax. It has a traditional cellar bar and restaurant (also open to non-residents) and is among the best located hotels in the city centre (within the main pedestrian area of York and overlooked by York Minster). The new Al-Fresco terrace is the largest beer garden inside the city walls. Also a venue for weddings and private dining. The Principal York, Station Rd, York, YO24 1AA,  The Principal York, steps from the train station, is the perfect base from which to discover the historic city of York. Blending the grandeur of late-Victorian architecture with the comforts of modern travel, The Principal York offers its guests the warmest welcome this side of the Pennines. The Grange Hotel, tel +44 1904 644744, . A few minutes walk from Bootham Bar, this is one of York's premier (and most expensive) hotels. A Georgian town house, it's gone for the country-house-chic look - all deep sofas, open fires and unobtrusive service. There are three restaurants ranging from a seafood bar, through contemporary cellar bar to the full-on French silver service. Not cheap, but deeply luxurious, and a real change from the standard pre-packaged international chain hotels. Hotel du Vin York, The Mount, tel +44 0844 748 9268, http://www.hotelduvin.com/locations/york/, Hotel du Vin York is housed in a Grade II-listed building that dates back to the early 19th century. Lendal Tower, . This newly refurbished luxury establishment will surely be one of York's main landmarks within a couple of years. The 5 star ancient property offers a range of services including guest accommodation, private butler and chef, weddings and private dining. Park Inn, North St, Y01 6JF  Tel +44 1904 459988. Located in the centre of York nearby to attractions including Jorvik Viking Centre, York Minster and the National Railway Museum. The University of York  is constantly one of the UK's top 10 performing universities, and is one of the top 100 in the world. The departments of English and Related Literature, Chemistry, Computer Science and Psychology are particularly well regarded internationally as leading research centres. York's std code (for landline numbers) is 01904 when dialed from within the British Islands or +44 1904 from abroad. City Screen Picturehouse, 13-17 Coney Street (tucked away behind Saint Martin's church - look for the iconic clock) ☎ 0871 704 2054 has computers, printing, and wireless in the Basement Cafe. If you bring your own laptop, wireless is £1 otherwise you pay by the amount of time spent online. Evil Eye Lounge, 42 Stonegate, ☎ +44 1904 640002. Just as with City Screen, if you bring your own laptop wireless access is just £1. Pay at the counter just as you walk in to get that day's access code. York Central Library, Museum Street (between the river and the Minster). Ask at the enquiry desk - you'll see plenty of locals using the computers, but the staff can arrange Web access for visitors too. Opens until 20:00 on Mondays, Tuesdays and Fridays. Free City centre Wi-Fi is also available in Saint Helen's Square and Coney Street with a free wireless connection, open to laptops, smart phones or any other internet-enabled devices in the area. Just like in every town and city York has its bad parts that are best avoided: areas that seem to keep appearing in newspaper reports! The main places include the outlying suburbs of Tang Hall, Bellfarm, Foxwood, Chapelfields, Layerthorpe and Clifton, and even inner city areas such as Walmgate and The Groves. However most of these areas are much more tame than areas of neighbouring Leeds, Bradford and Hull. Also try to avoid secluded cycle paths at night as it is not unknown (but still fairly rare) for robberies to take place in these parts, however this tends to be away from the main city centre. Knife-crime rates are fairly low in more recent years with only the occasional stabbing per month. Gun-Crime is extremely rare in York, due to only a handful of firearm related cases have occured in the past decade. The centre of town, however, is as civilised as everywhere else in Britain. Take care on weekend evenings in York. Plenty of local youngsters overestimate their capacity for alcohol and the city centre can seem to be awash with lager louts, mainly over the river in the Micklegate area. If you are approached just keep on walking and they will find another victim to pester. Aim for our recommended pubs, though, and you'll find that safe socialising in the company of affable locals is still possible! Aldborough Roman Villa  - it`s a bit of a push to the top of the county but well worth the trouble. Castle Howard  - one of the locations for the filming of Brideshead Revisited, this amazing stately home is a great day trip out of York. If you've got a car and go to Castle Howard its worth a look at Kirkham Priory too, just off the A64 at the top of the hill near Castle Howard. Additional local historic sites in the York area include Beningbrough Hall, Bolton Abbey, Nunnington Hall and Riveaux Abbey. Yorkshire Lavender - Only 3 miles from Castle Howard, Yorkshire's Award-Winning Lavender Farm & Lavender Gardens is set in a spectacular hillside farm of nearly 60 acres, within the Howardian Hills Area of Outstanding Natural Beauty. Leeds - biggest city in Yorkshire. Fantastic for shopping, drinking, dining, and as a base for exploring Yorkshire. Northallerton - from here get a bus to the picturesque, authentic, village of Osmotherley with three great pubs and plenty of good walking. The coast - Victorian Scarborough with two popular beaches and a castle, Victorian Bridlington, Filey and Whitby. Filey is a smaller and less developed resort; it is home to a brigg that can be accessed at low tide, has long stretches of beach, however has reduced facilities compared to its larger neighbours. Whitby is a popular coastal town and home to many historic sites of interest. If you are visiting the town around mealtimes try one of the fish and chip restaurants. The portions are large and the taste to die for. Mushy peas are optional! This used to be the national dish before chicken tikka massala - and in Whitby they show you why. If you are travelling the main road between Scarborough and Whitby, try making a detour into the moors on the landward side of the road. Only a couple of miles or so from the road you will be into a land of babbling brooks and comfortable pubs (most without music) where you can enjoy a quiet drink and a well-cooked meal at very reasonable cost. And the plus is it seems like another world. Thirsk - small horse-racing market town. Well known as a horse racing venue, but for me its claim to fame is as the home of James Herriott. There is a museum dedicated to his (real) life and veterinary practice and is well worth making a detour to visit. It`s a "hands on" type of museum and to any fans of the books and films constitutes and couple of hours well spent. You can sit in the actual Austin 7 car that he made his visits in and can round off the visit in the museum shop. Enjoy! Afterwards a drink in a local pub and perhaps a (very) substantial lunch. This page was last edited on 7 April 2019, at 11:57.